"This is a recipe that my Mom makes on holidays but is great any time of the year. This is an awesome recipe and very easy to make"
Melt butter in a saucepan over medium heat. Fold shrimp into melted butter to coat. 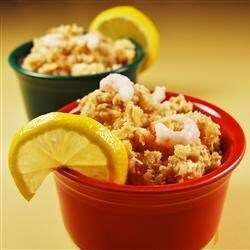 Mix cracker crumbs, lemon juice, and garlic powder into shrimp; transfer into a 9-inch square baking dish. Cover dish with aluminum foil. Bake in the preheated oven until bubbling, about 45 minutes. I had all of these ingredients on hand and was pleasantly surprised with the outcome. Next time I may add some hot sauce to the butter. I did this exactly as the recipe was written. It was super easy, I already had everything to make it, and my boyfriend loved it. I served the scampi over whole wheat linguine.